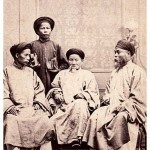 A Nguyen delegation, tasked with negotiating with the French. The conquest and colonisation of Vietnam began gradually but accelerated through the mid-1800s. Catholic missionaries had arrived in the region in the 1600s, followed by French traders through the 1700s. 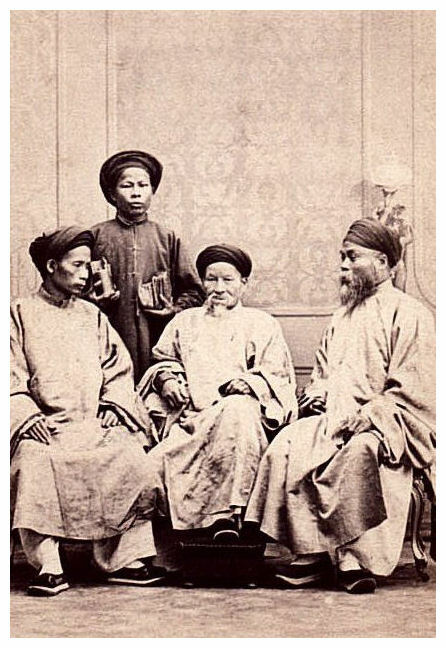 The Nguyen emperors of the early 1800s, nervous about the effects of Catholicism on their people, attempted to nullify missionary activity. The last Nguyen emperor, Tu Duc, had several foreign missionaries executed, while others were expelled from Vietnam or thrown into prison. But this persecution of Catholics handed France a pretext for extending its reach and influence in Vietnam. In 1857 Paris began preparing a punitive military campaign against the Nguyen rulers in Vietnam, ostensibly in response to the execution of two missionaries. Commanded by Admiral Rigault de Genouilly, this invasion force of 14 warships and almost 3,000 men landed in September 1858. It quickly captured the central coastal port of Da Nang, which was renamed Tourane by French officials. French military planners expected the Indochina campaign to be short and simple. These predictions were soon proved wrong. The small French garrison in Tourane was surrounded and besieged for two years. Vietnamese Catholics did not rise up and support the French, as they had anticipated. Instead, Nguyen loyalists formed clandestine militia groups that moved in secret and in the dead of night, targeting lone French soldiers, stealing or sabotaging equipment, poisoning French wells or food stores. An even deadlier scourge for the French was the local climate and infectious diseases, particularly dysentery, malaria and cholera. Around 1,000 French soldiers perished in Vietnam between late 1858 and 1862, most from illness. Only the arrival of 3,500 reinforcements from China in early 1861 allowed the siege of Tourane to be broken. With more troops and the modern advantages of small arms, mortars and naval artillery, French forces quickly gained the upper hand. Crucially, the French controlled the southern provinces, where much of the nation’s rice was grown and harvested. Confronted with the possibility of food shortages, starvation and possibly a full-scale French invasion, the Nguyen rulers sought a negotiated peace settlement. This came with the Treaty of Saigon in June 1862. In this treaty, Tu Duc ceded control of Saigon and Vietnam’s three southernmost provinces (Bien Hoa, Gia Dinh and Dinh Tuong) to the French. Together these territories were to form the French colony of Cochinchina. France was also given sovereignty over Poulo Condore, an island off the southern coast of Vietnam, and full access to the ports of Da Nang (Tourane) and Hue. French ships were given unrestricted rights to the Mekong River, which provided access to central Cochinchina and into Cambodia. Catholic priests and missionaries were afforded full access to Vietnam; an imperial order guaranteed no further persecutions or restrictions on foreigners and missionaries. In effect, the Treaty of Saigon carved off the southern corner of Vietnam and surrendered it to France as a colonial possession. But the French also exerted influence over the rest of the country. Tu Duc retained the imperial throne but his independence and authority were weakened. The emperor agreed not to enter into additional foreign treaties, agreements or commercial arrangements without French endorsement. He accepted Francophile officials and French advisors into his court, many of them acting under instructions from Paris. The emperor, in effect, was little more than a French puppet. Tu Duc’s weakness, along with his unwillingness to support anti-French resistance movements in southern Vietnam, alienated many of his mandarins. One of these, Truong Dinh, was so outraged that he disobeyed the emperor and fled the imperial capital in Hue. Truong Dinh relocated to the south and took charge of resistance forces there. His forces were eventually defeated by the French, while Dinh himself committed suicide in August 1864. The French held an ascendant position by the mid-1860s but were not satisfied. Through a combination of threats and gunboat diplomacy, the French began expanding their grip on the kingdom. In 1867 they accused Tu Duc of supporting resistance movements, and ‘retaliated’ by occupying three more provinces. French troops under the command of Admiral de la Grandiere marched into Chau Doc, Vinh Long and Ha Tien, bringing the whole of southern Vietnam under French control. 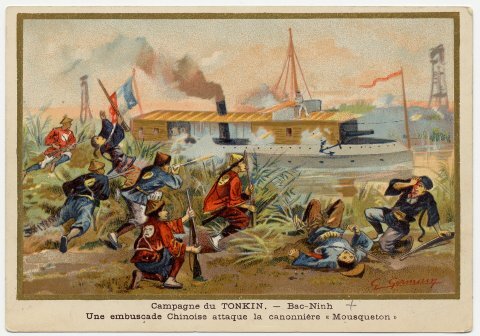 French traders, eager to do business with the Chinese, pushed for greater control in Tonkin, to give them access to southern China. 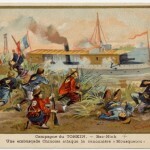 In 1873 French forces attacked Hanoi in the north and coerced Tu Duc into signing a new treaty. The Second Treaty of Saigon (March 1874) expanded Cochinchina to include the three additional provinces captured in 1867. The French were given access and trading rights to Hanoi, Haiphong and the Red River. The French march into northern Vietnam was briefly stalled, first by the Black Flag Army (a local resistance movement) and then by the Chinese, who also coveted control of northern Vietnam. The brief Sino-French War (1884-85) ended with a French victory and the Treaty of Tientsin, which removed the last major obstacle to French colonisation of Indochina. By the end of 1884, there were more than 16,000 French troops in Vietnam. In 1887 the government in Paris proclaimed the Union Indochinoise, which was comprised of three Vietnamese regions: Cochinchina (south) Annam (central) and Tonkin (north), as well as Cambodia. Laos would be added to the union in 1893. There were several local rebellions and nationalist uprisings in the 1890s, but all were eventually suppressed by French forces. Tu Duc died in 1883, reportedly condemning the French with his dying words. He was followed by a string of emperors who were all weak and unwilling to resist French infiltration. In 1895 Paris appointed a civilian governor general, Paul Doumer, and instructed him to set up a framework for colonial administration, investment and business in Indochina. Doumer’s changes included the division of Indochina into three provinces and the replacement of local officials with French or Francophile bureaucrats. Doumer also began constructing a framework for the economic exploitation of Vietnam, including the implementation of French monopolies over the sale of salt, alcohol and opium. 1. French military action in Vietnam began in the late 1850s, in response to the execution of Catholic missionaries. It began with the siege of Tourane in Annam. 2. Despite heavy losses, the French military soon overwhelmed local troops. They eventually forced Emperor Tu Duc to sign the Treaty of Saigon in 1862. 3. Tu Duc’s authority was weakened and he became a puppet leader, while the French moved to expand their control over both north and south Vietnam. 4. Southern Vietnam was brought under French control in 1867 and renamed Cochinchina. Hanoi was attacked and occupied in 1873; the northern regions of Vietnam were known as Tonkin. 5. In 1887 Paris combined the regions of Annam (central Vietnam), Tonkin (northern Vietnam) and Cochinchina (southern Vietnam) into a new colonial entity called French Indochina. J. Llewellyn et al, “The conquest and colonisation of Vietnam”, Alpha History, accessed [today’s date], https://alphahistory.com/vietnamwar/conquest-and-colonisation-of-vietnam/.